Since I am starving all the time these days and truly eating to provide for two of us, I tried to hunt down the perfect lactation cookie recipe. I found a few that I liked but since every one was missing one or more of the key elements I wanted to include, I ended up making a hybrid recipe. The result is a cookie that is sweet, chewy, and dense, with an almost umami flavor, filled with chewy raisins and substantial chocolate chips. So far, I have made several batches of these delectable cookies, and intend to keep on making them long after my breast-feeding days are over. After they cool, I freeze them in bags so I can reheat them or just eat them cold. Read on to find out about the ingredients and scroll to the bottom for my hybrid recipe. Flax seeds ground to a meal and mixed with water is one ingredient in this cookie. Flax seed adds Omega-3 fatty acids, fiber, and lignans (plant-based Estrogen). 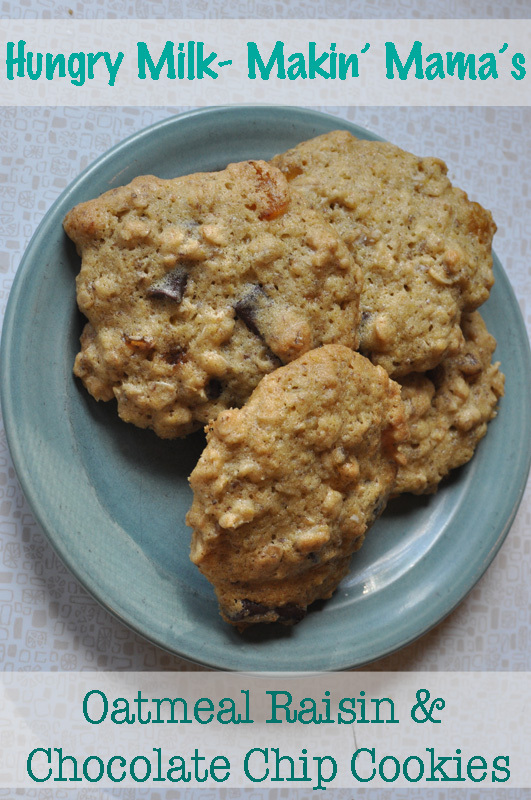 Two more key ingredients in these cookies were golden raisins and big chocolate chunks. I discovered took late that the golden raisins I used are preserved with sulfites, so I won’t be using those again, as Eric is sensitive to sulfites. 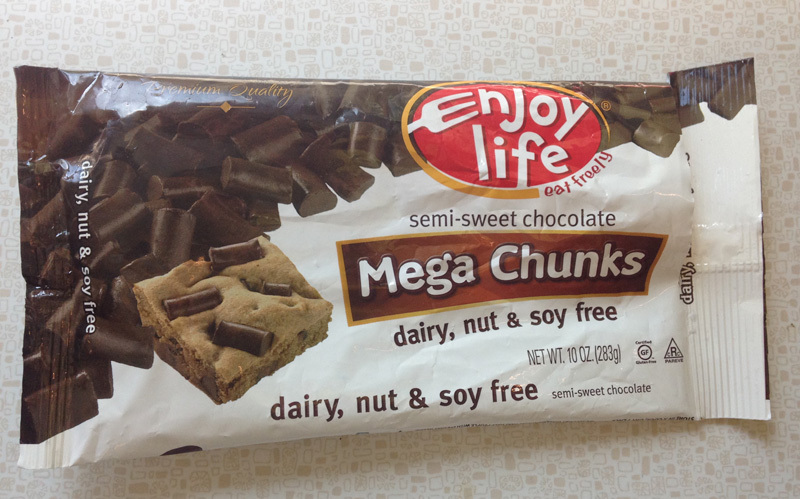 The chocolate chunks I used are made by Good Life. I keep these around my kitchen for my allergy-free baking I do for numerous friends and family members. 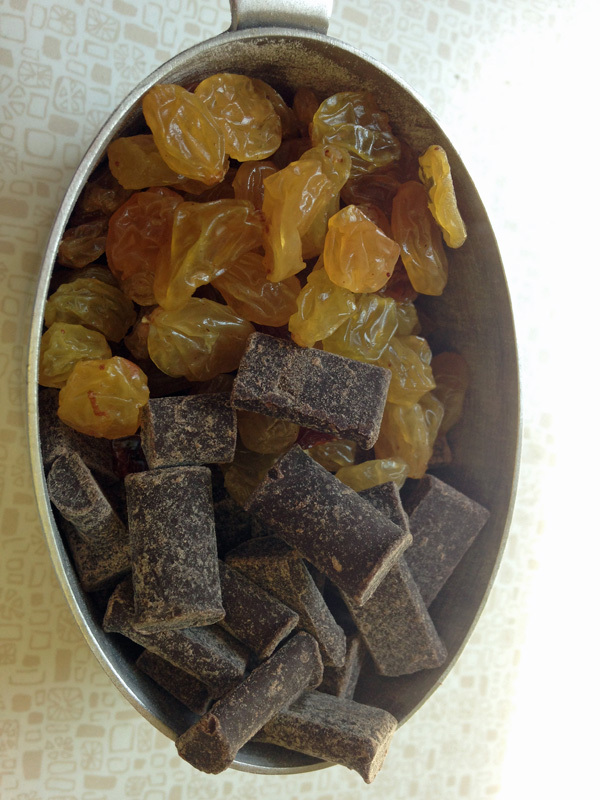 I love the size and shape of these non-traditional chocolate chunks! Greta was a big helper in making these cookies. 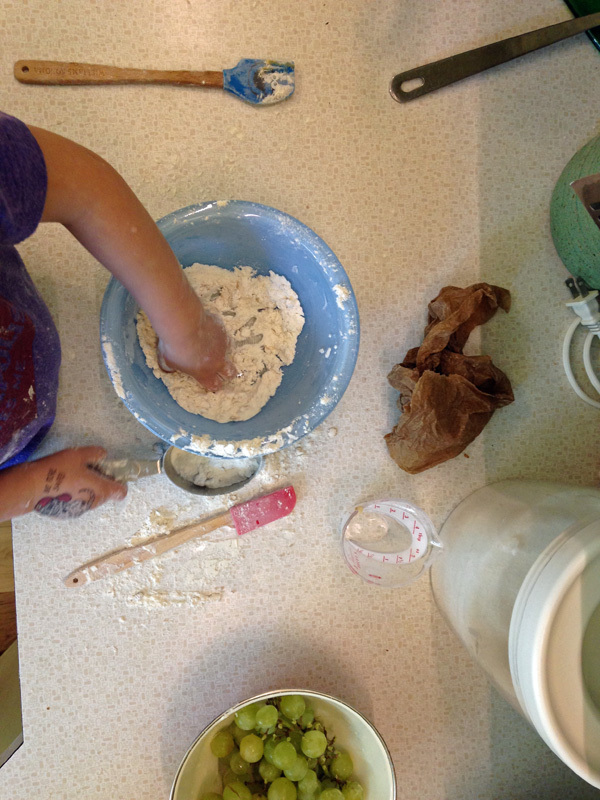 Actually, she mashed her own bowl of ingredients together while eating flour covered grapes. I have begun to get very creative in my methods for keeping her entertained and busy with the addition of baby #2. More on baby #2 and our current life in a later post. 1. 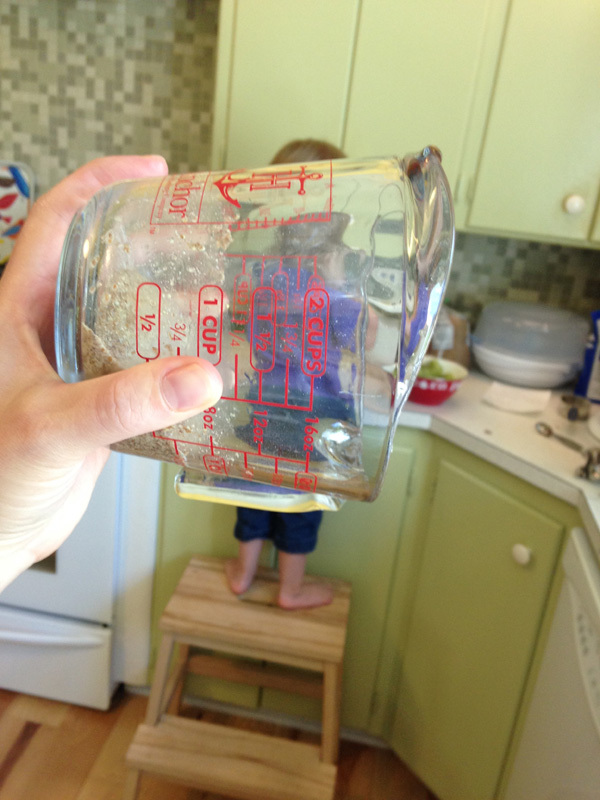 In a small bowl combine 1/4 cup water with 2-1/2 tablespoons flax meal. Allow to sit for about 5 minutes. 2. 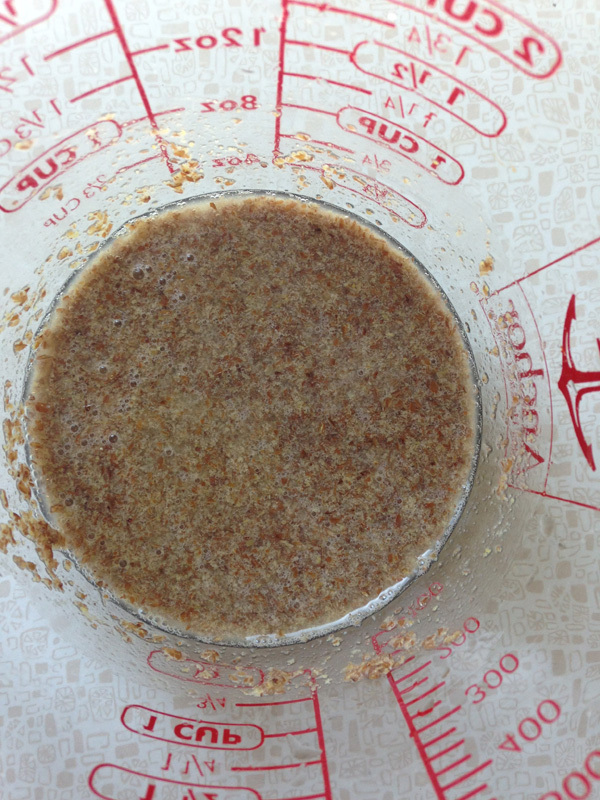 In a bowl or mixing stand, cream 1 cup shortening (butter, margarine, or coconut oil) with 1-1/2 cups brown sugar. Add flax meal mixture and 2 eggs. Beat until combined. 3. In a separate bowl combine 2 cups flour, 1/4 cup brewer’s yeast, 3 tablespoons wheat germ, 1 teaspoon baking soda, 1/2 teaspoon salt, and 1/2 teaspoon cream of tartar. 4. Stir the flour mixture into the sugar and shortening mixture. Stir in 2-1/2 cups rolled oats, 1 cup golden raisins, and 1 cup chocolate chunks. 5. Drop rounded spoonfuls onto ungreased cookie sheets and bake in a 350° oven for 10-15 minutes or until cookies are golden. Allow cookies to cool for 2 minutes before removing from cookie sheet.